Mail-Art on Wikipedia (timeframe 29-4-2016) – iuoma.org – Interested in Mail-Art? From Wikipedia, the free encyclopedia on 29-4-2016. Mail art (also known as postal art and correspondence art) is a populist artistic movement centered on sending small scale works through the postal service. It initially developed out of the Fluxus movement in the 1950s and 60s, though it has since developed into a global movement that continues to the present. The American artist Ray Johnson is considered to be the first mail artist, and the New York Correspondence School that he developed is considered the first self-conscious network of mail artists. Media commonly used in mail art include postcards, paper, a collage of found or recycled images and objects, rubber stamps, artist-created stamps (called artistamps), and paint, but can also include music, sound art, poetry, or anything that can be put in an envelope and sent via post. Mail art is considered art once it is dispatched. Mail artists regularly call for thematic or topical mail art for use in (often unjuried) exhibition. The mail artist community values the interconnectedness of the participants and promotes an egalitarian ethos that frequently circumvents official art distribution and approval systems such as the art market, museums, and galleries. Mail artists rely on their network as the primary way of sharing their work, rather than being dependent on the ability to locate and secure exhibition space. The community embraces this outsider or alternative status, and refers to itself as “The Eternal Network” or just “The Network.” At its core, mail art is about interpersonal communication, exchange and the creation of a virtual community of participants. In this way, mail art can be seen as anticipating the cyber communities founded on the Internet. Ray Johnson’s experiments with posting instructions and soliciting activity from his recipients began in the late 1950s, and provided mail art with a blueprint for the free exchange of art via post. In 1962, Plunkett coined the term “New York Correspondence School” to refer to Johnson’s activities; Johnson adopted this moniker but intentionally misspelled it as “correspondance.” The deliberate misspelling was characteristic of the playful spirit of the Correspondance School and its actions. Most of the Correspondance School members are fairly obscure, and the letters they sent, often featuring simple drawings or stickers, often instructed the recipient to perform some fairly simple action. Johnson’s work consists primarily of letters, often with the addition of doodles and rubber stamped messages, which he mailed to friends and acquaintances. The Correspondance School was simply a network of individuals who were artists by virtue of their willingness to play along and appreciate Johnson’s sense of humor. One example of the activities of the Correspondance School consisted in calling meetings of fan clubs, such as one devoted to the actress Anna May Wong. Many of Johnson’s missives to his network featured a hand drawn version of his personal logo, a bunny head. In 1970, Johnson and Marcia Tucker organized The New York Correspondence School Exhibition at the Whitney Museum in New York, which was the first significant public exhibition of the mail art genre. On April 5, 1973, Johnson declared the “death” of the New York Correspondance School in an unpublished letter to the Obituary Department of The New York Times and in copies that he circulated to his network. However, he continued to practice mail art even after this. In his 1973 diagram showing the development and scope of Fluxus, George Maciunas included mail art among the activities pursued by the Fluxus artist Robert Filliou. Filliou coined the term the “Eternal Network” that has become synonymous with mail art. Other Fluxus artists have been involved since the early 1960s in the creation of artist’s postage stamps (Robert Watts, Stamp Dispenser, 1963), postcards (Ben Vautier, The Postman’s Choice, 1965: a postcard with a different address on each side) and other works connected to the postal medium. “Indeed, the mail art network counts many Fluxus members among its earliest participants. While Johnson did not consider himself directly as a member of the Fluxus school, his interests and attitudes were consistent with those of a number of Fluxus artists. In the 1970s, the practice of mail art grew exponentially, providing a cheap and flexible channel of expression for cultural outsiders and demonstrating a particular vitality where state censorship prevented a free circulation of alternative ideas, as in certain countries behind the Iron Curtain or in South America. The growth of a sizable mail art community, with friendships born out of personal correspondence and, increasingly, mutual visits, led in the 1980s to the organization of several festivals, meetings and conventions where networkers could meet, socialize, perform, exhibit and plan further collaborations. Among these events were the Inter Dada Festivals organized in California in the early 1980s and the Decentralized Mail Art Congress of 1986. In 1984, the evolving norms of the mail art community were tested when curator Ronny Cohen organized an exhibition for the Franklin Furnace, New York, called “Mail Art Then and Now.” The exhibition was to have an historical aspect as well as showing new mail art, and to mediate the two aspects Cohen edited the material sent to Franklin Furnace, breaking an unwritten but commonly accepted custom that all works submitted must be shown. 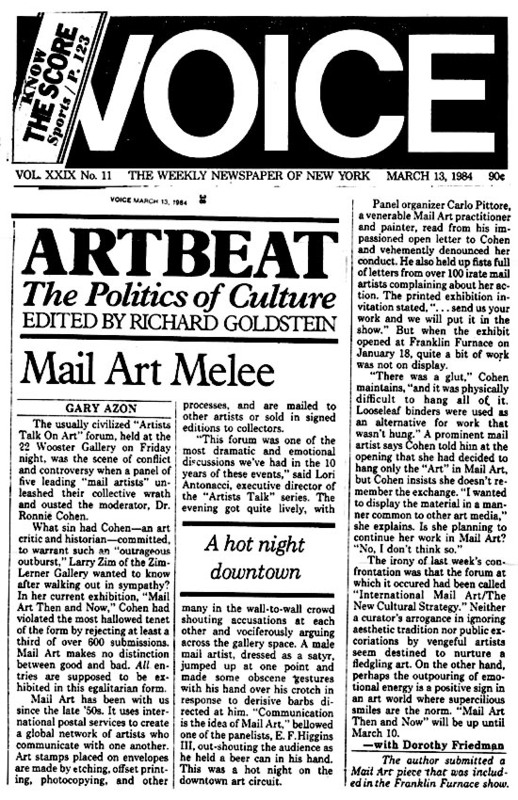 The intent to edit, interpreted as censorship, resulted in a two-part panel discussion sponsored by Artists Talk on Art (organized by mail artist Carlo Pittore and moderated by art critic Robert C. Morgan) in February of that year, where Cohen and the mail artists were to debate the issues. On the second night, the mail artists read a prepared manifesto penned by Pittore, and Cohen was jeered from the stage; during the ensuing melee all of the panelists also walked out. 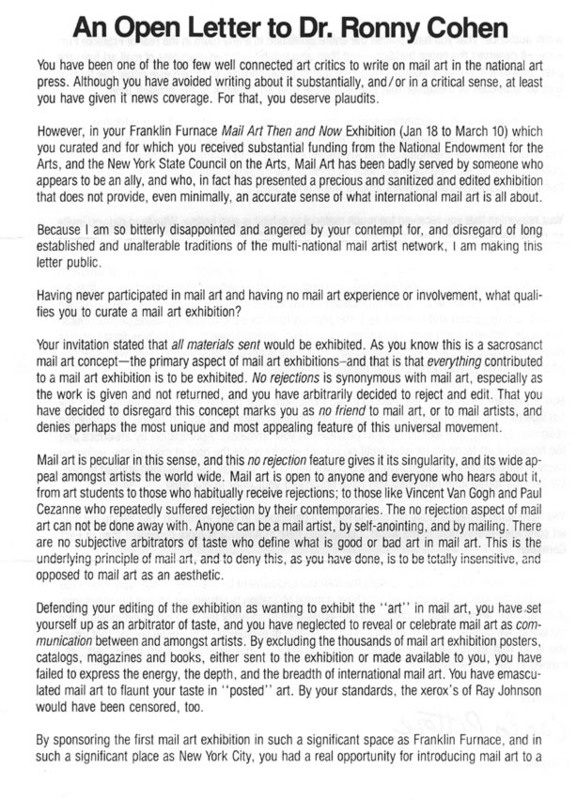 The excluded works were ultimately added to the exhibition by the staff of the Franklin Furnace, but the events surrounding it and the panels revealed ideological rifts within the mail art community. Simultaneously fanning the flames and documenting the extent to which it was already dominated by a small, mostly male, coterie of artists, the discussions were transcribed and published by panelist John P. Jacob in his short-lived mail art zine PostHype. In a letter to panelist Mark Bloch, Ray Johnson (who was not a panelist) commented on the reverse-censorship and sexism of the event. American mail-artist David Horvitz (active since the 2000s) meets Brazilian mail artist Paulo Bruscky (active since the 1970s) in Berlin, Germany in November 2015. In 1994, Dutch mail artist Ruud Janssen began a series of mail-interviews which became an influential contribution in the field of mail art. The mail art philosophy of openness and inclusion is exemplified by the “rules” included in invitations (calls) to postal projects: a mail art show has no jury, no entry fee, there is no censorship, and all works are exhibited. The original contributions are not to be returned and remain the property of the organizers, but a catalogue or documentation is sent free to all the participants in exchange for their works. Although these rules are sometimes stretched, they have generally held up for four decades, with only minor dissimilarities and adjustments, like the occasional requests to avoid works of explicit sexual nature, calls for projects with specific participants, or the recent trend to display digital documentation on blogs and websites instead of personally sending printed paper to contributors. A mail artist may have hundreds of correspondents from many different countries, or build a smaller core circle of favorite contacts. Mail art is widely practiced in Europe, North and South America, Russia, Australia and Japan, with smaller numbers of participants also in Africa, and China. In addition to being kept by the recipient, mail art archives have attracted the interest of libraries, archives, museums, and private collectors. Or, the works may be ‘worked into’ and recycled back to the sender or to another networker. Ray Johnson suggested (with a pun) that “mail art has no history, only a present”,[this quote needs a citation] and mail artists have followed his playful attitude in creating their own mythologies. Parody art movements like neoism and plagiarism have challenged notions of originality, as have the shared pseudonymous names Monty Cantsin and Karen Eliot, which were proposed for serial use by anyone. Semi-fictional organizations have been set up and virtual lands invented, imaginary countries for which artistamps are issued. Furthermore, attempts have been made to document and define the history of a complex and underestimated phenomenon that has spanned five decades. Various essays, graduate theses, guides and anthologies of mail art writings have appeared in print and on the Internet, often written by veteran networkers. Because the democratic ethos of mail art is one of inclusion, both in terms of participants (‘anyone who can afford the postage’) and in the scope of art forms, a broad range of media are employed in creation of mail artworks. Certain materials and techniques are commonly used and frequently favored by mail artists due to their availability, convenience, and ability to produce copies. Mail art has adopted and appropriated several of graphic forms already associated with the postal system. The rubber stamp officially used for franking mail, already utilized by Dada and Fluxus artists, has been embraced by mail artists who, in addition to reusing ready-made rubber stamps, have them professionally made to their own designs. They also carve into erasers with linocut tools to create handmade ones. These unofficial rubber stamps, whether disseminating mail artists’ messages or simply announcing the identity of the sender, help to transform regular postcards into artworks and make envelopes an important part of the mail art experience. Mail art has also appropriated the postage stamp as a format for individual expression. Inspired by the example of Cinderella stamps and Fluxus faux-stamps, the artistamp has spawned a vibrant sub-network of artists dedicated to creating and exchanging their own stamps and stamp sheets. Artist Jerry Dreva of the conceptual art group Les Petits Bonbons created a set of stamps and sent them to David Bowie who then used them as the inspiration for the cover of the single “Ashes to Ashes” released in 1980. Artistamps and rubber stamps, have become important staples of mail artworks, particularly in the enhancement of postcards and envelopes. The most important anthology of rubberstamp art was published by the artist Hervé Fischer in his book Art and Marginal Communication, Balland, Paris, 1974 – in French, English and German. Some mail artists lavish more attention on the envelopes than the contents within. Painted envelopes are one-of-a-kind artworks with the handwritten address becoming part of the work. Stitching, embossing and an array of drawing materials can all be found on postcards, envelopes and on the contents inside. Printing is suited to mail artists who distribute their work widely. Various printmaking techniques, in addition to rubber stamping, are used to create multiples. Copy art (xerography, photocopy) is a common practice, with both mono and color copying being extensively used within the network. Ubiquitous ‘add & pass’ sheets that are designed to be circulated through the network with each artist adding and copying, chain-letter fashion, have also received some unfavorable criticism. [according to whom?] However, Xerography has been a key technology in the creation of many short-run periodicals and zines about mail art, and for the printed documentation that has been the traditional project culmination sent to participants. Inkjet and laserprint computer printouts are also used, both to disseminate artwork and for reproducing zines and documentation, and PDF copies of paperless periodicals and unprinted documentation are circulated by email. Photography is widely used as an art form, to provide images for artistamps and rubber stamps, and within printed and digital magazines and documentation, while some projects have focused on the intersection of mail art with the medium itself. Lettering, whether handwritten or printed, is integral to mail art. The written word is used as a literary art form, as well as for personal letters and notes sent with artwork and recordings of the spoken word, both of poetry and prose, are also a part of the network. Although English has been the de facto language, owing to the movement’s inception in America, an increasing number of mail artists, and mail artist groups on the Internet, now communicate in Breton, French, Italian, German, Spanish, and Russian. In addition to appropriating the postage stamp model, mail artists have assimilated other design formats for unique and printed artworks. Artists’ books, decobooks and friendship books, banknotes, stickers, tickets, artist trading cards (ATCs), badges, food packaging, diagrams and maps have all been explored. The wealth of materials, techniques and formats available ensures that mail artists routinely mix media. Collage and photomontage are popular, affording much mail art the stylistic qualities of pop art or Dada. Mail artists often use collage techniques to produce original postcards, envelopes and work that may be transformed using copy art techniques or computer software, then photocopied or printed out in limited editions. Printed matter and ephemera are often circulated among mail artists, and after artistic treatment, these common items enter into the mail art network. Small assemblages, sculptural forms or found objects of irregular shapes and sizes are parceled up or sent unwrapped to deliberately tease and test the efficiency of the postal service. Mailable fake fur (“Hairmail”) and Astroturf postcards were circulated in the late 1990s. Having borrowed the notion of intermedia from Fluxus, mail artists are often active simultaneously in several different fields of expression. Music and sound art have long been celebrated aspects of mail art, at first using cassette tape, then on CD and as sound files sent via the Internet. Performance art has also been a prominent facet, particularly since the advent of mail art meetings and congresses. Performances recorded on film or video are communicated via DVD and movie files over the internet. Video is also increasingly being employed to document mail art shows of all kinds. “Mail Art”. Collection: MOCA’s First Thirty Years. MOCA: The Museum of Contemporary Art, Los Angeles. Retrieved 11 April 2013. Phillpot, Clive (1995). Chuck Welch, ed. Eternal Network: A Mail Art Anthology. Canada: University of Calgary Press. Retrieved 11 April 2013. “Mail Art”. Digital Collections, UB Libraries. University at Buffalo, The State University of New York. Retrieved 11 April 2013. “Mail Art @ Oberlin”. Oberlin College Art Library. Oberlin College & Conservatory. Retrieved 11 April 2013. Richard Kostelanetz; H. R. Brittain (2001). A Dictionary of the Avant-gardes. Routledge. p. 388. ISBN 978-0-415-93764-1. “About John Held Jr. in the Spark episode “The Fine Art of Collecting””. Spark. KQED. 2004. Retrieved 11 April 2013. Plunkett, Edward M. (1977). “The New York Correspondence School”. Art Journal (Spring). Retrieved 11 April 2013. Danto, Arthur C. (March 29, 1999). “Correspondance School Art”. The Nation. Retrieved 11 April 2013. “Oral history interview with Ray Johnson, 1968 Apr. 17”. Archives of American Art. Smithsonian Institution. Retrieved 11 April 2013. 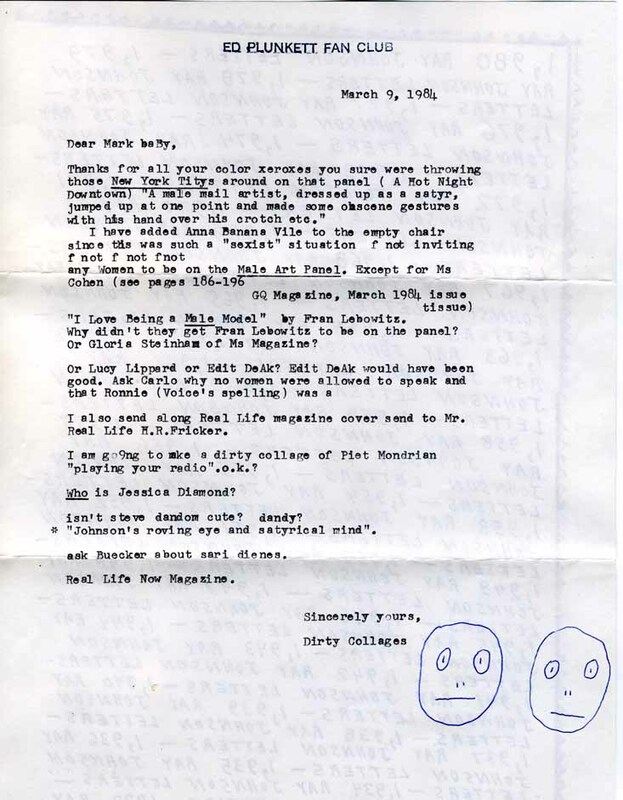 “Ray Johnson mail art to Lucy R. Lippard, 1965 June 29”. Archives of American Art. Smithsonian Institution. Retrieved 11 April 2013. “Ray Johnson Biography”. Ray Johnson Estate. Retrieved 11 April 2013. Bloch, Mark. “An Authentik and Historikal Discourse On the Phenomenon of David Zack, Mail Artist”. In Istvan Kantor. Amazing Letters: The Life and Art of David Zack. Retrieved 11 April 2013. Jacob, John (1985). “East/West: Mail Art & Censorship”. PostHype 4 (1). ISSN 0743-6025. Lloyd, Ginny (1981). “The Mail Art Community in Europe”. Umbrella Magazine 5 (1). Ross, Janice (August 26, 1984). 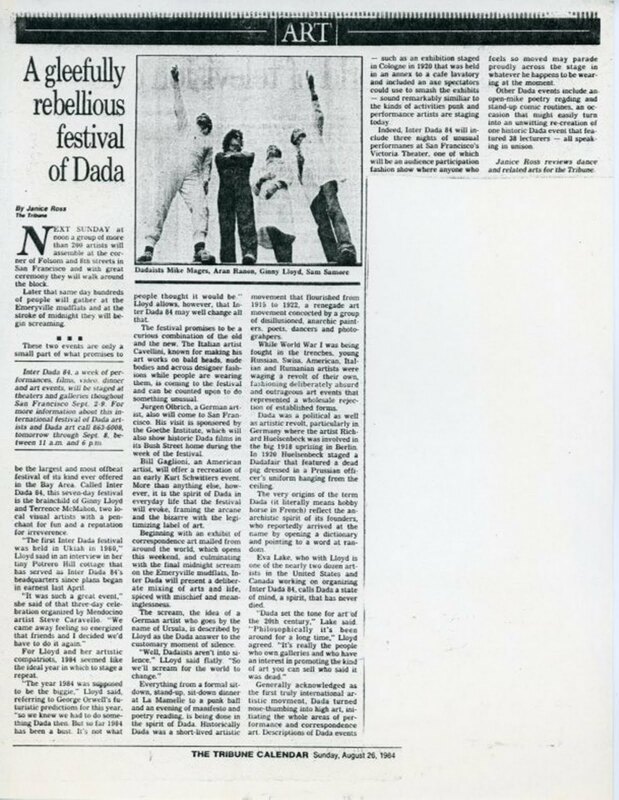 “A gleefully rebellious festival of dada”. Oakland Tribune (Art: The Tribune Calendar). Retrieved 11 April 2013. “Hans-Reudi Fricker”. Mail Art @ Oberlin. Oberlin College & Conservatory. Retrieved 11 April 2013. “Mail Art From 1984 Franklin Furnace Exhibition”. Franklin Furnace. Retrieved 25 January 2014. Pittore, Carlo. “An Open Letter to Dr. Ronny Cohen (part 1)”. panmodern.com. Retrieved 25 January 2014. Pittore, Carlo. “An Open Letter to Dr. Ronny Cohen (part 2)”. panmodern.com. Retrieved 25 January 2014. Azon, Gary (March 13, 1984). “Mailart Melee”. Village Voice. Retrieved 25 January 2014. Mark, Bloch. “Franklin Furnace Fracas”. Retrieved 25 January 2014. Jacob, John (1984). “Mailart: A Partial Anatomy”. PostHype 3 (1). ISSN 0743-6025. Mark, Bloch. “Ray Johnson’s letter to me after the event, questioning the issue of sexism.”. panmodern.com. Retrieved 25 January 2014. Jacob, John (1987). The Coffee Table Book of Mail Art: The Intimate Letters of J.P. Jacob, 1981 – 1987. New York: Riding Beggar Press. Guy Bleus (Ed. 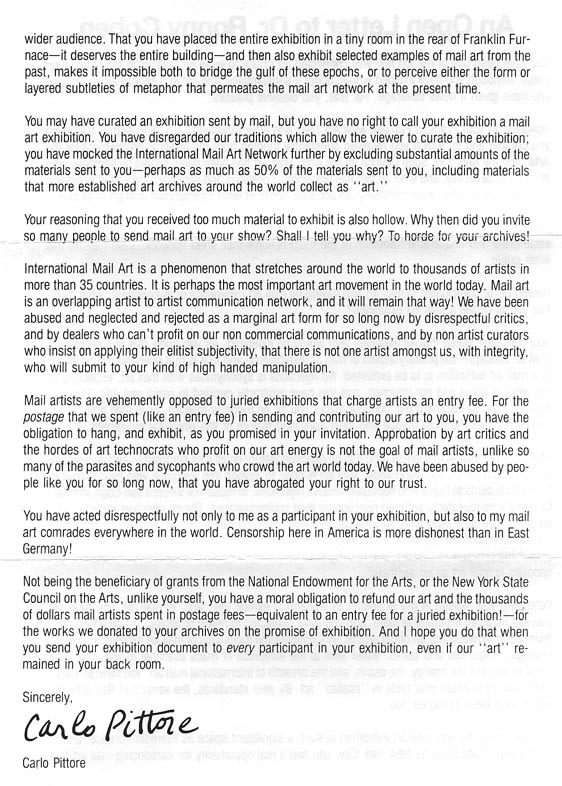 ), Re: The E-Mail-Art & Internet-Art Manifesto, in: E-Pêle-Mêle: Electronic Mail-Art Netzine, Vol.III, n° 1, T.A.C.-42.292, Hasselt, 1997. Welch, C. (1995). Eternal network: A mail art anthology. Calgary, Alta: Univ. of Calgary Press. C. Carr (9 April 2012). On Edge: Performance at the End of the Twentieth Century. Wesleyan University Press. pp. 105–. ISBN 978-0-8195-7242-4. Belgian Postal Service, Guy Bleus & Jean Spiroux, Journée du Timbre: Mail-Art, 2003. Griffin, Roger. “Scary Monsters”. Bowie Golden Years. Elving, Bell (April 30, 1998). “Pushing The Envelope”. The Washington Post. Jacob, John (1984). The International Portfolio of Artists Photography. New York: Riding Beggar Press. Christoph Cox; Daniel Warner (1 September 2004). Audio Culture: Readings in Modern Music. Continuum. pp. 60–. ISBN 978-0-8264-1615-5. “The Techniques”. Mail-Art:The Forum. Retrieved 23 October 2013. Friedman, Ken (1984). Wilson, Martha, ed. “Mail art history: the Fluxus factor”. FLUE – Special Issue: Mail Art (Franklin Furnace) 4 (3–4).